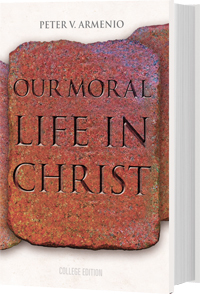 This college edition of Our Moral Life in Christ by Rev. Peter Armenio focuses on the Person and teachings of Christ and examines the moral life from that perspective. Christian morality is not only for "knowing," but also for "living." This is a practical manner in which the spirit of Christ is made manifest in the world, thus contributing to the improvement of society. Based on the Ten Commandments and the Beatitudes, Our Moral Life in Christ presents the teachings of the Magisterium on moral issues in modern society. Inspired by recent papal documents, especially the encyclical The Splendor of Truth, and the Catechism of the Catholic Church, this book provides the moral formation that will help the reader to become more Christlike in service of love and in the journey toward personal perfection as well as providing the foundation to pursue advanced theological studies.